This license plate cover fits behind all License Plate Frames. Plate size 7"x4" plate . Comes with a Hi Quality Plastic plate cover and foam and instruction's. The clear plate and foam goes between your License Plate Frame and License plate. Cover gives your ride the finishing touch and keep out dirt and water. The PlateMate is a clear license plate cover that enhances the license plate area, but the real reason it was made to stop the theft of the tags on the license plates, and of course to keep the license plate clean. Tie down brackets are made of billet aluminum. 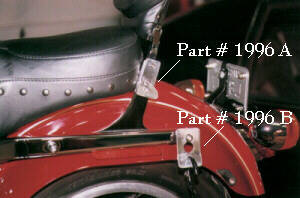 Part Number 1996 A bolts on at the sissy bar. Part Number 1996 B just hooks on at stud. These studs can be purchased at your Harley Dealer. When you are trailing your bike, it should be secured with two sets of tie downs at all times. Part number 1996B Cost $49.95 A Set. Motorcycle Blanket Not Like Any You Have Seen "Our Blanket is the only Blanket that is trailerable. No one else can make that statement!" F 0 B Ferndale Mi. Warranties will be handled by respective companies.